This one of the most widely reported signs of an angel around you. White feathers may appear in the most unlikely of places. When you have found your white feather, carry it around with you to keep your angel close. 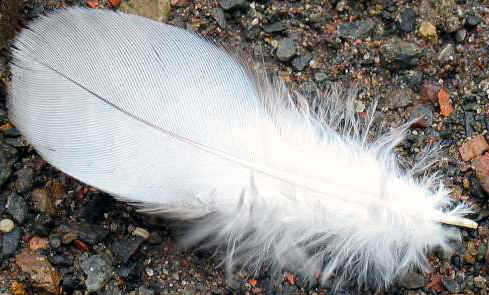 Sceptics often find after dismissing the existence of angels that they are suddenly seeing white feathers everywhere! You may see angels in cloud formations, especially over sacred sites or when you have asked for angelic assistance. Sometime you may even see clouds that resemble feathers! 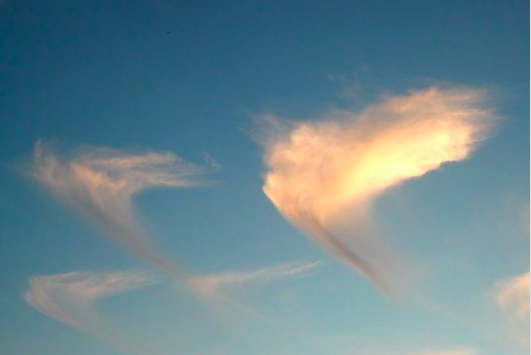 Many people throughout the world have taken photographs of angel clouds and some are extremely convincing. Often after you’ve asked for angelic help you will hear the word ‘angel’ mentioned just about everywhere i.e. on a song on the radio, on a television programme, in newspaper articles, or someone may even say the word to you in an unlikely context. Since the time of Noah's ark, rainbows have been symbolic of God's promise of love, care, and protection. When you ask the angels for a sign and you see a rainbow, it signals that your entire situation is being taken care of by them. 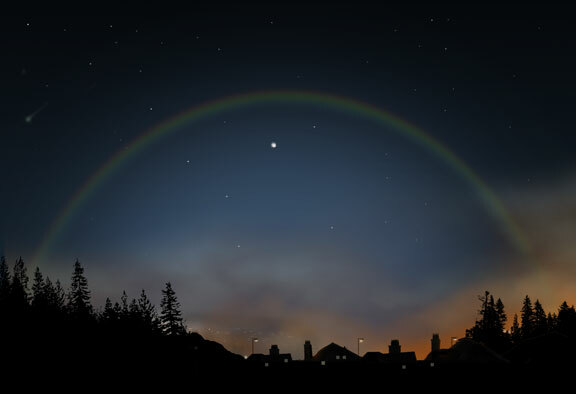 Albino rainbows, double rainbows, and moonbows (rainbows appearing at night under the moonlight) are all so unusual that they leave no doubt as to their significance. Rainbows are not only signs, but also gifts of encouragement and guidance from the other side. When there's an impending emergency or an excess of personal stress, the only way that the angels can ensure you'll hear them is through direct verbal communication. And if the angels talk, there's no doubt as to their message and meaning, and you should definitely listen. Hearing your name called by a disembodied voice is actually a common experience. This happens to most people as they're awakening from sleep, since that's when we're most open to hearing the angels. The voice of God and the angels is that of love and wisdom. When they speak up, it's loud, clear, and unmistakable. It means they along with other higher spiritual beings are around you and you are being protected, supported and loved. Occasionally I will hear my name called out by a familiar voice, such as a friend, an old acquaintance or even a family member, when no one is there. Also, I often see lunar rainbows, or "moonbows" as you call them and, whether by coincidence or as a sign, I have a knack for finding or seeing shooting stars. I'll never forget the one I saw that was green, blue and silver, appearing partway through the sky and disappearing before it reached the horizon. I saw two last night in fact…. I mean no disrespect in the following statement nor am I suicidal, but I have asked and prayed and still nothing, in fact the more I try to get answers on why I feel like there is something more, something I should be doing, why I feel the need to save every person I come across and feel sad when someone I dont know passes as if they were a part of my heart and all the other things that I feel, all the things I can't answer, the more things I lose, so far the count is up two possibly even three children a wife and a brother, all of which I feel like it was my burden they beared and my punishment they suffered, so if I'm missing something here please fill me in, I know that there is something more than this and I want to see, I want to know why I give what I give and why I don't feel right in my own skin, like there is something I should or could be doing to save the people, especially the ones I care about. I sound crazy I know but I feel it as if it were engraved into every fiber of my being, I find reasons to hope when there clearly is no hope to found, I need answers. As I was going to sleep about a month ago I asked God if He could let md know my guardian angel's name. When I woke up I remembered a specific name that I never heard before. I wondered if maybe I made it up but when I went to sleep the next night 2 more names came up in my head. After looking up name meanings…turns out they are different translations of each other!!! I had an experience with Archangel Michael a few years ago. I was really stressed out with a financial worry. It was early evening and I was falling asleep in the living room, in that momemnt where you are between being awake and asleep. I had what I can best describe as a mental vision of Archangel Michael. He was tall and strong/muscular yet thin/fit. He had shoulder length blonde straight hair. He had a presence of great love and protection. He was putting my yellow blanket around my shoulders as he told me, "I have everything under control." I woke up and the stress knot I had for a few days was instantly gone. I felt no more pain like I had been. I also receive feathers as signs from angels, and have received two angel coins out of the blue. I know they are a strong presence in my life and I am extremely grateful for them. I communicate with them every day. This is a late response to this, but I lost my best friend 3 weeks ago and one night I was talking to the stars and I too saw a shooting star. The first one was small but then I saw one like you described. Big colorful but the one I saw kind of exploded in the sky. It was a very neat experience and that's how I know my friend was with me. Like to share My Story as well. It was somewhere autumn 2012 where I suddenly had a deep need for spiritual growth. Started learning about chachras, spirituality and meditation as well as what we truly are. In one of the first meditations, I invited an angel into my house. At the moment during the meditation where I entered my house with the angel through the front door, my white shepherd dog ran to the door and started barking. Wow. That was impressive. Later on I have got to know that Muriel is the name of my angel. Meditation is a great way to communicate with these lovely beings. Blessings to you all. On the 28th I seen two rainbows the first one I seen was a short line and was kind of faded then I looked back in the sky it was gone then I seen a second one and it was shaped like the letter v and with cloulds around it and making it look like the rainbow was sitting on the cloud with the sun shinnging behind the cloud it was beautiful. And on the 29th I seen a huge rainbow that was around the sun a half Circle and with some clouds around it, last thing one night I was reading the bible until I had gotten tired so I went to bed and I had this dream and I was in it and I seen this golden light shinnging from above and down on this podium and it had a book on it and the pages was turning and I heard this masculine voice from above and I was trying to hear what it was saying as I got closer to the podium the voice was fading out until I couldnt hear it no more and then woke up and askes myself was god talking to me? Then the next night I went to sleep to try to have that dream again so I could see if I could hear the voice again and see waht it waa saying but I never had that dream again. It’s so hard for us humans to understand why angels appear as they do and why they act as they do. I don’t know if we ever will understand the whole picture. They appear in our paths trying to help us, they leave feathers to show us they are there and sometimes to point the way. But we don’t always get what they are trying to say. I’ve often seen clouds in the form of angels, found white feathers just lying around and I always had something good happen after those moments. What if your name is called at home, at work, and you know your alone, even when you turn around and find no one there? what if you “see” things in the night while you lay awake? these things don’t scare me, not even when they are close and my hand goes thru them as if they are floating particles? only when something else such as a snore sounds from my significant other, do I realize the “person” I am talking to becomes, or the “object” of my attention “floating particles” and dissipates? Can someone please explain to me what is happening. On Thursday evening about 9.30pm I was going to bed when I got the scent of Jasmine flowers and some other distinct fragrance. I live alone and I do have jasmine flowers in the garden but the are at the back of the house and not in bloom. The other fragrance seemed to be that of a male. The room was dark and I stopped took in these beautiful fragrances and left the room. A minute later I walked back into my bedroom to find the fragrances had diminished and gone very quickly. Is this a sign from above as I have been unwell.